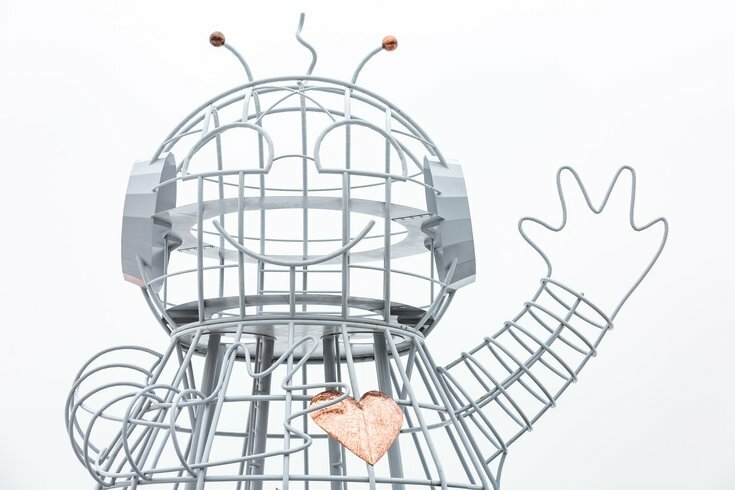 We now know what the previously unannounced project Bebot, a 33-foot tall, 13,000-pound robot sculpture from last year's Burning Man, will be part of in Northern Liberties. Bebot will stand at the center of property development company Post Brothers' new outdoor dining destination, Piazza Pod Park. Details on the 35,000-square-foot space, located at Germantown Avenue and North Second Street, were revealed Thursday. A rendering of Piazza Pod Park in Northern Liberties, which will open in May 2019. At the center is Bebot, a sculpture from Burning Man. 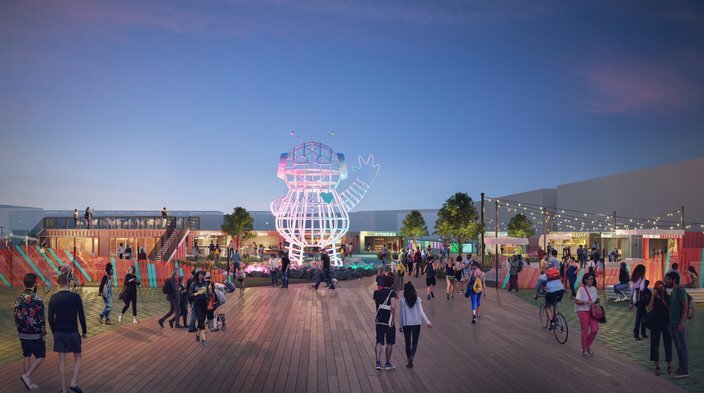 At the heart of Piazza Pod Park will be Bebot and an enclosed dining pod with a roof deck, while around the perimeter there will be 14 repurposed shipping containers offering food and drink laid out in a semi-circle. Many of the restaurant pods will have mini dining rooms, but there will also be plenty of outdoor seating. Adjacent to the park will be a lot with an expected 150 parking spots. For those taking public transportation, an art installation made from 185 color-changing light-up cubes (also from Burning Man) will connect the Market/Frankford line to the park. 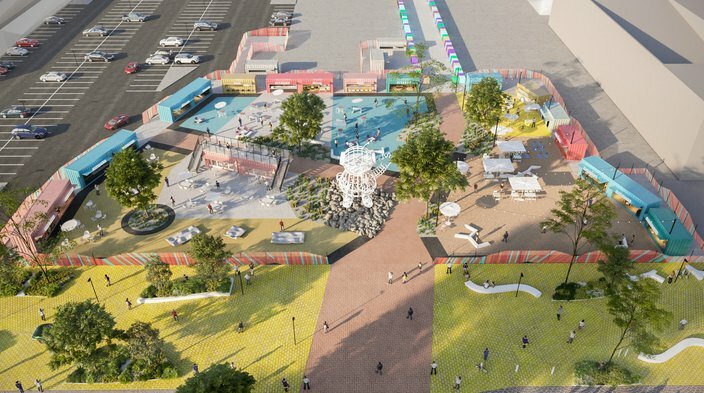 Piazza Pod Park is slated to open in early May and will offer year-round programming, such as movie nights and food festivals, in addition to being a dining destination. The idea for the mixed-use space originated back in 2017 when Post Brothers purchased the Piazza and Liberties Walk. "Our goal is to create the thriving community hub that the Piazza courtyard has always tried to be," said Post Brothers CEO Mike Pestronk. Events that were traditionally held in the courtyard will now move to the street on Germantown Avenue and into Piazza Pod Park. Many will return with new twists, more frequency or added features, and a range of new events are currently being discussed, according to a press release. As for the lineup of food and drink available, the first round of tenants for the restaurant pods have been announced. Spread Bagelry, Dim Sum House's Lil Sum Sum, French Toast Bites by Lokal Artisan Foods, New Liberty Distilling, Urban Village, Tiki Takos, Mama Maria's Italian Ice and Empanada Box will be moving in. Some of the pods will have windows that open to the outside, like a food truck, while others will have a window plus a dining room to use in the colder months. All the pods will be equipped with heating, air conditioning and speaker systems. When it officially opens, visitors can enjoy Piazza Pod Park seven days a week, from 7 a.m. to 10 p.m., or until midnight on Fridays and Saturdays. Rendering of Piazza Pod Park in Northern Liberties. There will be restaurant pods with mini-dining rooms and plenty of outdoor seating.